I like children’s rooms that convey personality and style, kid’s bedrooms with well-chosen pieces that avoid the “catalog look”. 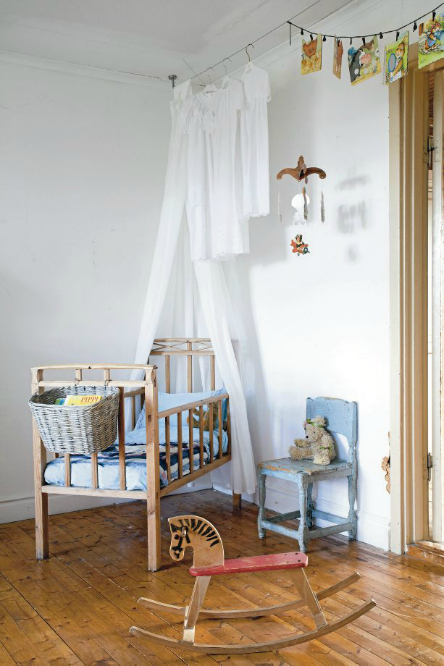 Today we show you a nursery room with plenty of character, decorated by Nicoletta from the lovely blog The Smallittle. This is Paola’s room, her younger daughter who is now 2.5 years old. 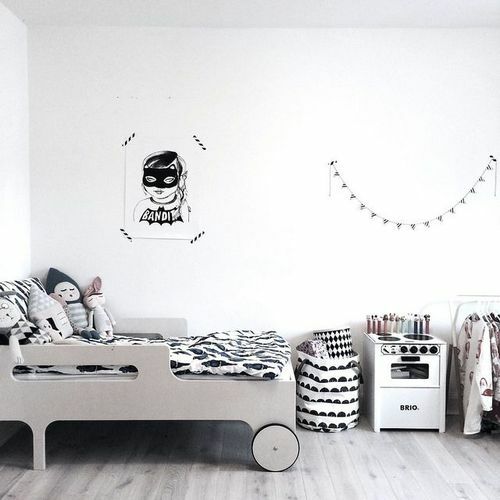 Nicoletta renovated her bedrooms last year and wanted a nursery in black and white with some greyish and pinkish details. 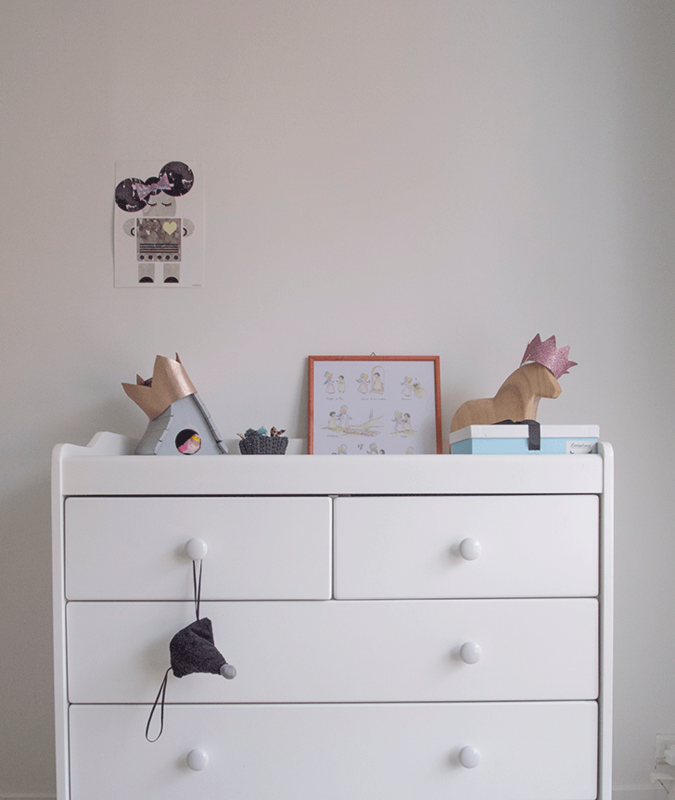 She had combined new products from small, creative boutiques with others she had from her first child (the white cot and chest of drawers) and the result is great. How many little treasures we can see in this room! 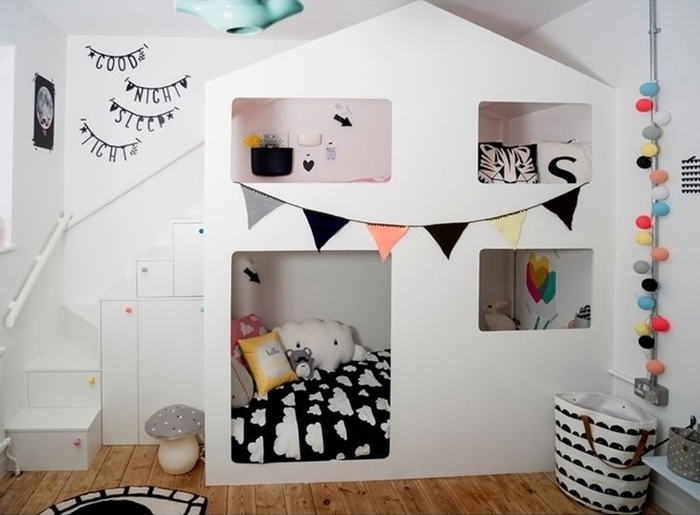 The sleeping area is composed of a cot and lots of sweet details, like Odette Swan Head from Sew Heart Felt, the Gran bed set from Fine Little Day or the vinyl “Grow Strong” by Shanna Murray. 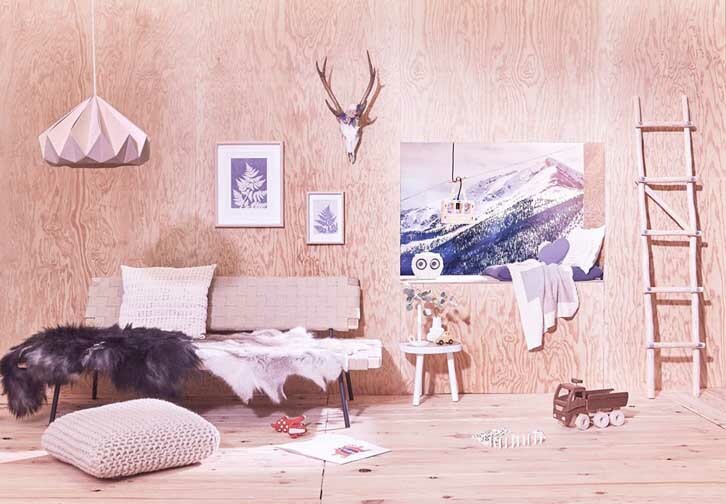 The décor accessories (postcards, dolls, little crowns…) add wittiness and a touch of colour to the room. Furthermore, changing these details you can instantly refresh the room. The smallest changes can make the biggest difference! Nicoletta painted only a part of one of the walls in black could give the effect of a monochrome room.The black wall serves well as the backdrop for the children’s books —the Mint Rhapsody acrylic shelves make the books stand out from the black wall— and some decorative pieces with a graphic touch —like the poster from Yorkelee Prints or the nesting dolls from Wee gallery. 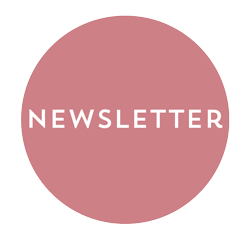 A paper lamp from Snowpuppe and a large Miffy Light are perfect to complement the child’s room décor. 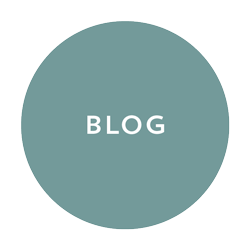 A DIY project is a great way to create a unique and personal space. We showed you 14 decoration ideas with sticks and branches and now we could add one more. 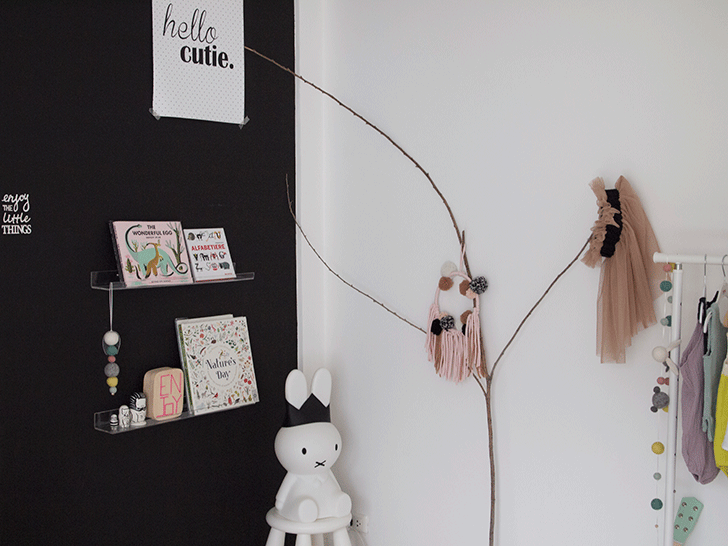 Nicoletta uses this branch for displaying little creations, like a dreamcatcher with pompoms from Minalulu. Simple, functional and original, isn’t it? 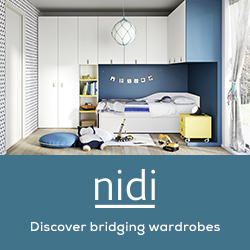 Nicoletta is still in a hunt for a nice wardrobe to fit in her little room, so hanging some of her clothes was a necessity which actually turned into a lovely part of her room’s decor. 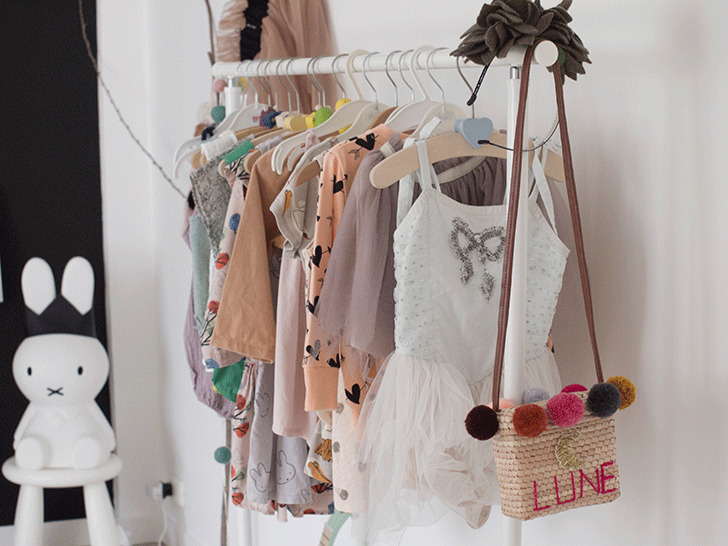 Don’t you love this hanging clothes rack? 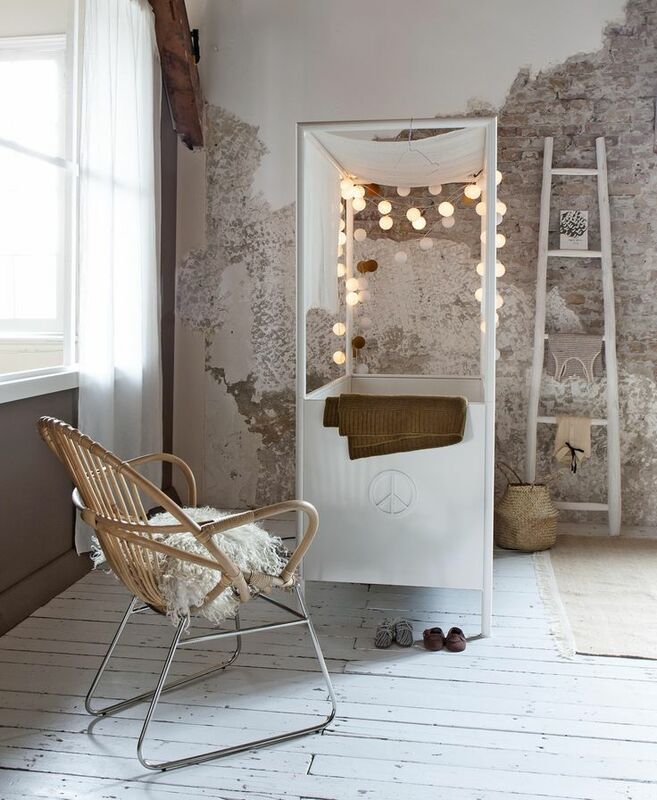 So this is a whimsical, creative space with many ideas to borrow. Which one is your favourite? We’d love to hear your insights!